The ongoing transformation of Wiltshire children’s services means its social workers are looking ahead to 2015 with a sense of both optimism and anticipation. Here’s how the impact of change has put the team in such a positive frame of mind. The last three years have seen major changes across social care at Wiltshire council. Fresh approaches and new ways of working have been backed with investment in buildings, facilities, resources and projects. Now these changes have been embedded, social workers on the frontline are seeing the benefits to themselves – and the families they work with. The whole team already has a laptop with Wi-Fi connection, enabling flexible and remote working, including from home. 3G notebooks are being trialled by some social work teams and will be launched to all teams later this year, so they can log in even without Wi-Fi. Having launched its multi-agency safeguarding (mash) hub in 2012, effective partnership collaboration is now well-established. Social workers work with police, health and education to triage cases and refer them to the most appropriate service. Innovation in professional practice is another cornerstone of the change. Wiltshire’s highly respected single assessment tool document has been a template for other local authorities, whilst a number of risk tools aid staff in the job. An early help service offering preventative interventions is set to reduce the pressure on safeguarding and assessment workers. There are also greater opportunities to move around to broaden skills and knowledge bases. “We have a robust programme of course and learning activities for all roles,” says organisational development and learning lead, John May. These activities will be strengthened by the launch of the Wiltshire Institute of Health and Social Care (WIHSC) in September. This new social work ‘academy’ will give staff access to a structured programme of development from newly qualified status right up to the highest levels. Ambitions are high. “We want the WIHSC to be talked about nationally,” May is happy to claim. For Herbert, development is key to the future of the service. “We’re an organisation that values individuals who are competent, capable and keen to progress. 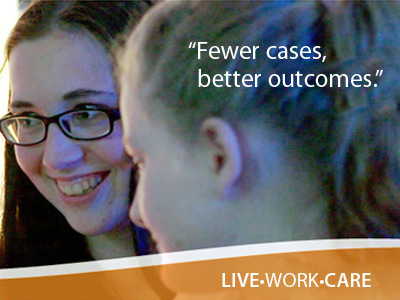 We want our social workers to be at the forefront of child protection. They are autonomous, they are empowered and they don’t have to have everything agreed in triplicate. We want them to be as independent as they possibly can.